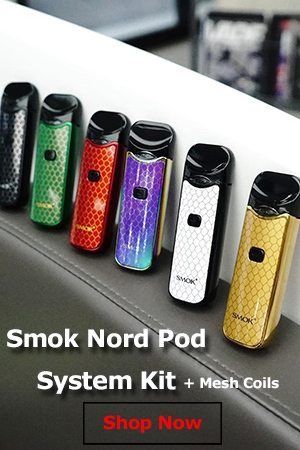 Get a 10% discount on the VaporFi Strawberry Shortcake ice Cream e-liquid and other VaporFi products by clicking the button below. You will be taken straight to the company website and the discount will appear automatically at checkout. 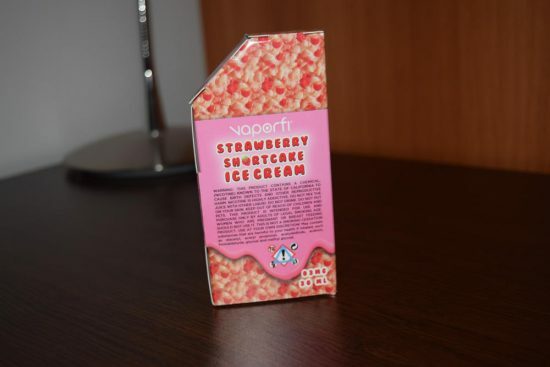 VaporFi recently teamed up with Cosmic Fog to create one of the most delicious desert vapes I have tried in a while – Strawberry Shortcake Ice Cream. Summer may be over, but let’s face it, it’s never a wrong time for some tasty ice cream, especially in vapor form. To be honest, when I first heard about the surprising partnership between two of the most well known brands in the vaping industry, I wasn’t very excited. I know Cosmic Fog is one of the most popular e-liquid makers out there – some would even say the most popular – but having reviewed their juice line a few months ago, I was left unimpressed. Some flavors were indeed tasty, but others were downright nasty, so overall, the whole line was average at best. But when VaporFi asked if I wanted to do a review of their new Strawberry Shortcake Ice Cream e-liquid that Cosmic Fog crafted exclusively for them, I was immediately intrigued. 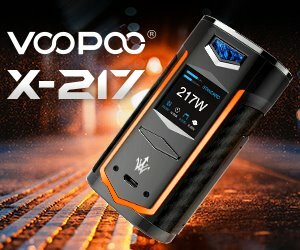 I had never tried this flavor before, and the advert on the VaporFi website alone made my mouth water. So I said ‘sure’, and I’m glad I did. The VaporFi Strawberry Shortcake ice Cream e-liquid comes in a big cardboard box shaped like a life-size strawberry shortcake ice cream. It looks good enough to make you want to take a bite, or at least tear through it faster so you can get to the juice inside. The box is big enough to accommodate a 60ml bottle, but right now VaporFi is only selling this e-liquid in 30ml bottles. Apart from the mouth-watering design, the packaging also features all the necessary information and warnings to make it compliant with the latest FDA regulations. You have the list of ingredients, manufacturer information, nicotine warnings, nicotine strength and warnings about potentially hazardous ingredients in the e-liquid. I actually found this last one to be quite disturbing. Here’s why: “May contain substances that are harmful to your health if inhaled, such as diacetyl, acetyl propionyl, acetylaldeheide, acetonin, formaldehyde, glyoxal and methyl glyoxal.” Those are all really nasty substances, and I for one would not want to inhale any of them. However, on the VaporFi website, this e-liquid is advertised as “acetyl propionyl-free and diacetyl-free”, and the company mentions that all its e-liquid formulas are registered with the FDA. So I’m guessing that the above line is just a generic warning that they are required to put on their products even if their juice contains none of those harmful substances. After all, formaldehyde is very unlikely to be found in e-liquid, as it was most often detected as a by-product of overheated vegetable glycerin. We’re likely to see such disturbing warnings on all e-liquids in the near future, so I for one would not worry about it too much. The e-liquid bottle itself has the usual cough-medicine bottle design, with a dropper cap. The white label features both the VaporFi and Cosmic Fog logos, as well as all the warnings and info on the cardboard box. 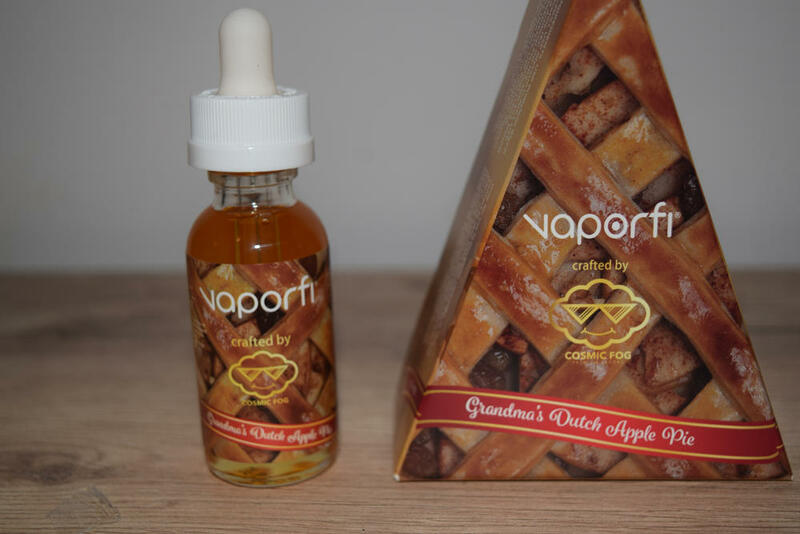 This e-liquid is 70VG/30PG and comes in three nicotine strengths (0.3%, 0.6% and 1.2%) as well as nicotine-free. Let me just start by saying that if you’ve been waiting for the day that strawberry shortcake ice cream was available in vapor form, you’re dream has become a reality. 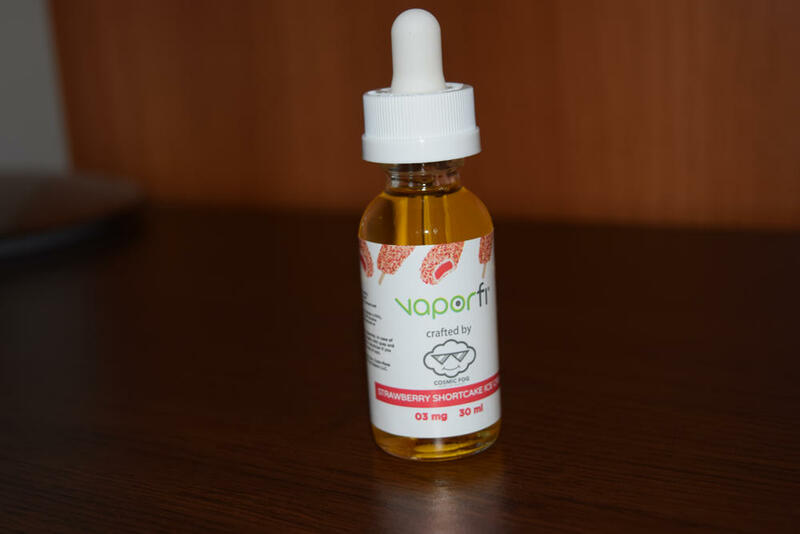 Unlike other e-liquids that have all these different flavors listed on the bottle, but only taste like one or two of them, VaporFi Strawberry Shortcake Ice Cream actually tastes as advertised. It’s actually insane that they managed to so faithfully recreate the taste of this popular summer treat and put in a bottle, but I guess the guys at Cosmic Fog really do know what they’re doing. VaporFi Strawberry Shortcake Ice Cream is everything an all-day vape should be. The complex flavors are subtle yet flavorful, it’s just sweet enough to make you want to take another hit, and it has a layer of delightful creaminess that makes the vapor feel velvety smooth as you exhale. 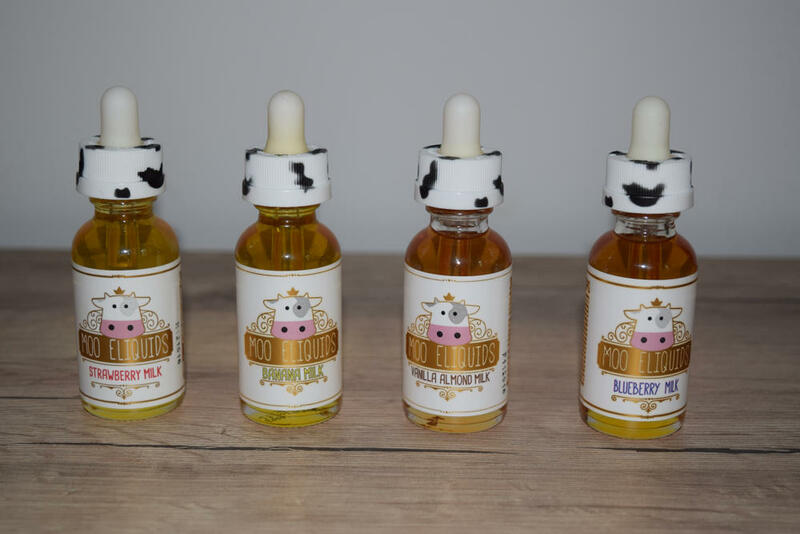 Think Cutwood unicorn Milk mixed with some shortcake and you get an idea of what this juice is about. 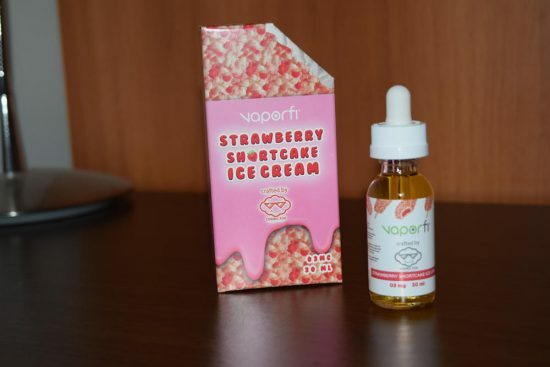 The taste of fresh, ripe strawberries is the first thing that hits your taste buds when you inhale VaporFi Strawberry Shortcake ice Cream, but the shortcake kicks in as soon as you exhale, mixing with the fruity and creamy layers and leaving you blissfully satisfied. It’s hard to put into words just how tasty the vapor is, but I just can’t imagine anyone saying that this is a poor quality juice. You might not be a fan of real strawberry shortcake ice cream, but you’d still have to appreciate how faithfully the taste is replicated in this e-liquid. VaporFi Strawberry Shortcake Ice Cream is definitely going in my top five favorite dessert vapes, and I highly recommend you give it a try. Just get a bottle and I guarantee you’ll be going back for more. This juice currently sells for $19.99, which is a very competitive price for a top-quality juice, but you can also get a small discount using the coupon code below. Enjoy, and please come back and let me know what you think after you’ve tried it, by posting your own review.